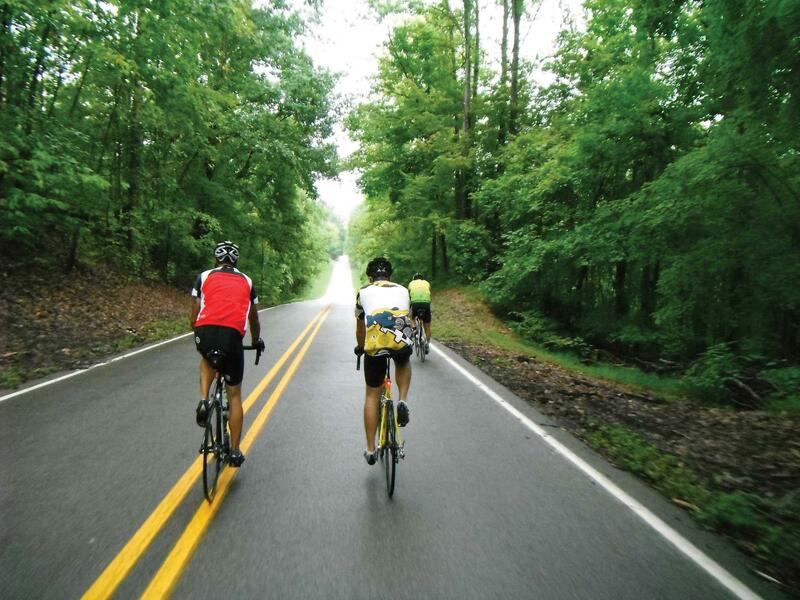 Next week, a first time cross-state bicycle ride launches. Leaders in small Missouri towns along the route are understandably eager to see the economic impacts of 1,000-plus riders cruising through town and spending their soggy dollars. On this week's Thinking Out Loud, KBIA's Trevor Harris explores the impact of tourism on small town economies. Next week, over 1,000 bicyclists will ride from west to east across north Missouri. Organizers and local leaders are banking on a big financial impact from the first Bike Across Missouri. When over 1,000 bicyclists depart from Rockport in northwest Missouri next week, Bike Across Missouri ride co-organizer Mike Denehy will breathe a bit easier. His new project will be off and running. (Or is it off and pedaling?) Several years in the works, the Bike Across Missouri, or big BAM is being spear-headed by Denehy's Off Track Events and Missouri Life magazine. I think it is finally to a point now where the state can embrace bicycle tourism and really do something great. There is a lot of beautiful scenery, a lot of great towns. There's a lot to offer... Towns in Missouri are realizing that bicycle rides are a good boost to their economy. If they can support it and bring people from other cities and other states it's good exposure for them and brings a little tourism to their towns. Local leaders along the route are preparing to greet the riders with hospitality, maps, showers and - America being a capitalist economy - opportunities to spend some cash. Novinger, Missouri is one of the towns along the five-day 300-mile ride route. Novinger Mayor Jeff Dodson has been busy organizing volunteers and vendors. As a whole year-round we look for opportunities to invite people into the community, so that it benefits the business community and citizens alike... [For the Bike Across Missouri] we're really excited, because we've alerted our local businesses, restaurants, different places in town and the downtown area that we're going to have a large number of folks are going to be in our community... We think it will be really good for our local business and local civic organizations will benefit from that as well with the sale of food and drinks. To introduce their town to the bicycle tourists the City of Novinger will also open their museum and a historic cabin next Thursday. Tourism events like the Bike Across Missouri as well as hunting season play an increasing role in the economies of small towns. Towns like Novinger whose populations have been declining since the early 20th century welcome tourists who come to hunt, dine and bicycle through town. MU Extension's Pat Curry works with small towns to help create economic development plans. These plans often involve tourism. Curry discusses in this episode of Thinking Out Loud why it is important for small towns to plan for about their future economies. Traditionally, the manufacturing businesses that may have been a backbone of the local economy especially in rural places migrated overseas or they have downsized because they automate. They have disappeared from the landscape in many places. Farming takes less labor than it ever did before. The job situation is pretty tough in a lot of places. One of the most important ways to think about this is economic diversification. Tourism is a simple way for a community to diversify their economic base. The Bicycle Across Missouri begins next Monday in northwest Missouri in Rockport and ends five days and 300 miles later in northeast Missouri in Canton. Flyers attached to bikes all over the city have the potential to get free taillights for cyclists in Columbia. Novinger, a small town west of Kirksville, is voting Tuesday on a proposition that would implement the town’s first ever sales tax. The proposed tax is a 1% sales tax and is estimated to raise between $10,000 and $15,000 annually.